You guys. I was a poll worker today. It was fun, if somewhat hot, with a few boring slow patches. But we got over a hundred voters, which I think is pretty good for a primary election. I love being involved in civic governance! And supposedly I even get paid, which is awesome. There were a few frustrations, though. It wasn't all peaches and cream. There was a little gentle encouragement for me to affiliate as a Republican so I could vote in the primary, but I was steadfast and just explained to them that I refuse to be put in a box. There were a few real cut-ups who made remarks about the President--the "worst president this country has ever had"--and one of them tried to get me to join in with him because I guess he is a jerk who thinks that everyone else agrees with him all the time. I tried ignoring him, but he badgered and badgered and kept saying, "Don't you think? Don't you think the machine isn't letting me vote because I talked bad about Obama?" Finally I just smiled politely with somewhat gritted teeth and said "I'm sorry, but we're not actually allowed to discuss politics." Ugh. Then the two other ladies who were working with me wanted talk about Kate Kelly's excommunication, and they just kept picking at it and picking at it, making some quite frankly sexist and uninformed comments, and finally I had to shut that down. I tried very hard to be tactful in my wet-blanket-throwing, but for crying out loud, am I the only one who read my poll worker's handbook about not discussing controversial topics at the polling location? TACKY TACKY TACKY. I have many thoughts about this issue, obviously, but that was so very much not the time and place for a nuanced discussion about it. I am getting a little bit sick of June. Gone too much, too much. I feel like I have done nothing but drive for three straight weeks. My poor goats barely recognize me, and I haven't even milked them yet. I wonder if I even remember how. I think maybe I can't eat dinner anymore. It always makes me feel sick and bloated clear until the next morning. Is this what it means to get old? How will I eat all the fun things if I have only two meals a day? Luke, I'm your father. It is useless to resist. Last night Grant and I went to the Neon Trees concert while John went with the other kids to a family wedding dinner. So Grant was the cool kid hanging out with his mom. It was his first real concert, and he got pretty bored with the opening acts and especially the interludes between bands. I think he was a little weirded out by the idea of jumping around and sweating and shouting lyrics with a bunch of strangers. But he loosened up eventually and we had a great time. Good enough that he said, "When I get a phone and a car I'm going to come to places like this by myself so I can meet girls." As though I'm not a good wingman! Girls love boys who go to concerts with their moms. And yea, verily, it was a great concert and there was much rejoicing. Seeing a band live is always a crapshoot--the sound quality is really unpredictable, and I pretty much hate the live version of any song. But Neon Trees is a good gamble--they sound terrific live. Would do business again. Now I'm off to girls' camp and it's a cold, rainy day. Should be a party. Is it too braggy to take my guitar? I hope not. I don't want to play for everyone/anyone, but tinkering around the campfire is a big part of the reason I got a guitar in the first place. Plus it's been two weeks since I've practiced and boy, does it show. I'm going to sleep in my car because I live in privileged circumstances that afford me the freedom to not sleep in a tent if I don't want to. Last week we were in Mexico. We ate all the tacos. We drank so much soda pop. I bought the biggest glass mixing bowl I have ever seen. We found a dead seagull at the beach and Grant spent about twenty minutes trying to fling it into the ocean without touching it. 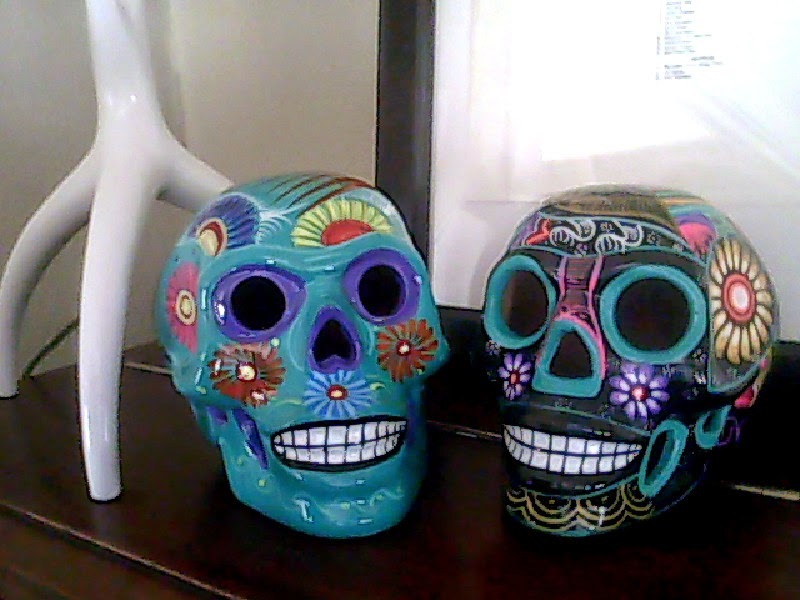 I bought another calavera (the black one is the new one). I don't know how "authentic" these terra cotta skulls are--I suspect they're just a silly touristy thing, rather than something that people actually use when celebrating Dia de los Muertos, but I love calaveras so much. The painting is so creamy and colorful, and I love what the designs symbolize. I love the tradition of Dia de los Muertos and would like to research it more, since it dovetails nicely with some of my Mormon beliefs. I love that the guy we bought the calavera from went into an elaborate lie story about how he paints them all by hand, back at his house, and tomorrow is his painting day, etc.--which is why all the calaveras in all the shops look exactly the same, don't you know. I realize that I'm tempting fate by buying another one because before long people are going to be like, "Oh, get her something with skulls on. She's the skull lady." And they'll try to give me skull kitchen towels and skull salad tongs and skull napkin rings and skull dishes. Just stop right there, amigos. We're going to keep doing things the same way we always have, which is with me being the one who decides what comes into this house. Where on the scale of cultural appropriation have I landed with the purchasing of the calavera things? Hopefully closer to the "creepy, but I see where you were going" end than the "you are a malignant harvester of other people's identities" end. All our baby goats are born now, and they're all boys, harrumph. One of Sally's is a roan and we may leave him intact for future siring needs. If so we'll call him Tyrone. The others are all bound for the auction or the chop, and I'm not even going to name any of them this year. None of them have captured my heart like Tex or Roger. The lazy chickens who have never laid any eggs finally started laying while we were gone. So either they were just really slow developers, or they were eating the entire egg plus shell, or they were too traumatized by last year's skunk attack to start laying before now. Who knows? At least they're finally earning their keep.